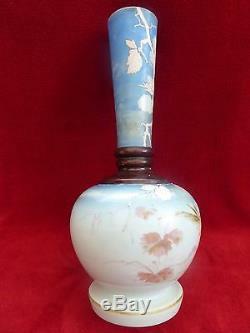 Is a large antique Victorian. 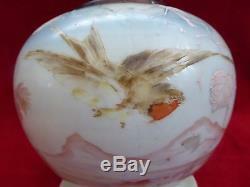 Hand Painted French Opalescent Art Glass Swallow Bird Vase, circa 1890. 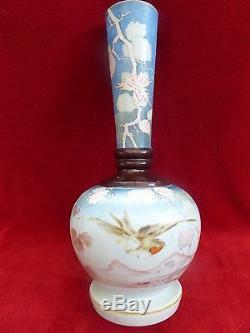 This beautiful large narrow necked vase has an image of a Swallow in flight amongst some foliage with mountains in the background. 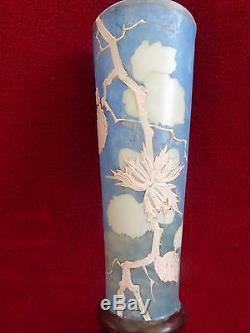 There is also detailed trailing vine running from the top lip down to the circular base, painted in pink enamel paint. 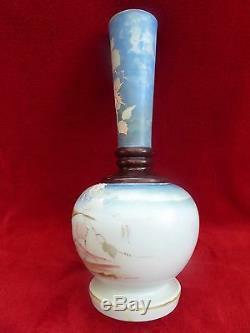 The vase has an overall sky blue background, which is darker at the top and lightens up as it moves down the vase. The top of the circular section also seems to have a lighter area that I think imitates clouds in the sky. Also the thick collar where the top narrow section joins the base has been painted in a dark brown. 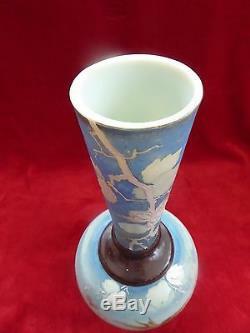 The glass itself seems to be a very pale blue opalescent colour and I cant find a makers mark or signature on the base, which is not unusual for glass of this period. 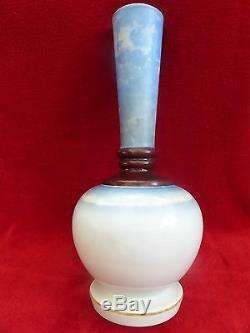 The Vase is in great condition no cracks that I can see, just some light wear to the finish in some areas. 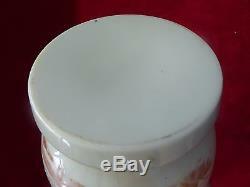 It measures 15.75 (40cm) high, 6.75 (17cm) diameter at its widest point and has a 2.5 (6.2cm) diameter opening at the top. Please see my pictures for the details of the condition, which complement this description. Many thanks for taking the time to look. 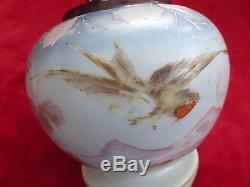 The item "LARGE HAND PAINTED FRENCH OPALESCENT ART GLASS SWALLOW BIRD VASE c1890" is in sale since Wednesday, March 15, 2017. This item is in the category "Pottery, Porcelain & Glass\Glass\Date-Lined Glass\Victorian (c. The seller is "safinob" and is located in Reading. This item can be shipped worldwide.